BIR Form 1701Q, also known as Quarterly Income Tax Return For Self-Employed Individuals, Estates and Trusts (Including those with both Business and Compensation Income) is a tax return intended for professionals and self-employed individuals who are engaged in a sole proprietorship business. Start generating quarterly income tax returns by going to your dashboard then proceed to Income Tax Return. 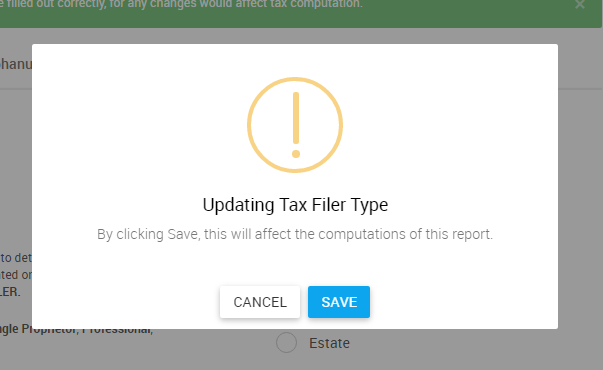 Choose the 1701Q tab then click the Generate Report (plus icon) to continue. 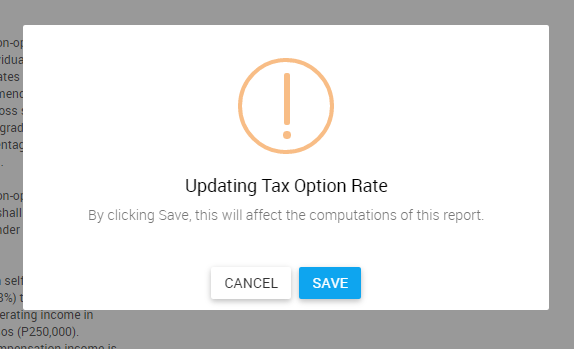 Select the year, as well as the appropriate quarter for the return, then click the Generate button. 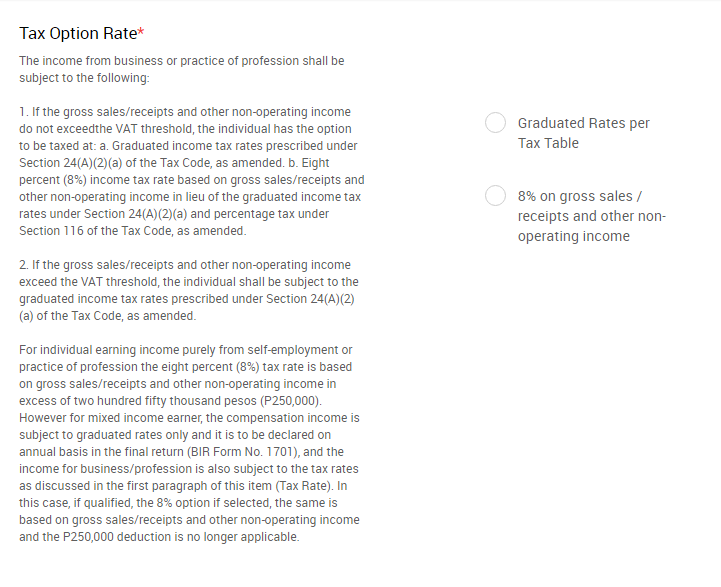 For the tax rate option, you need to choose between the radio buttons if the report that you'll be creating would focus on either: (1) Graduated Rates per Tax Table or (2) 8% on gross sales / receipts and other non-operating income. After clicking any of the radio button(s), you will see this dialog box. Click Save to continue. Click the BACK TO INPUT SUMMARY button to continue. After generating your report, you’ll be prompted to the Input Summary window where you need to enter information for your 1701Q return. 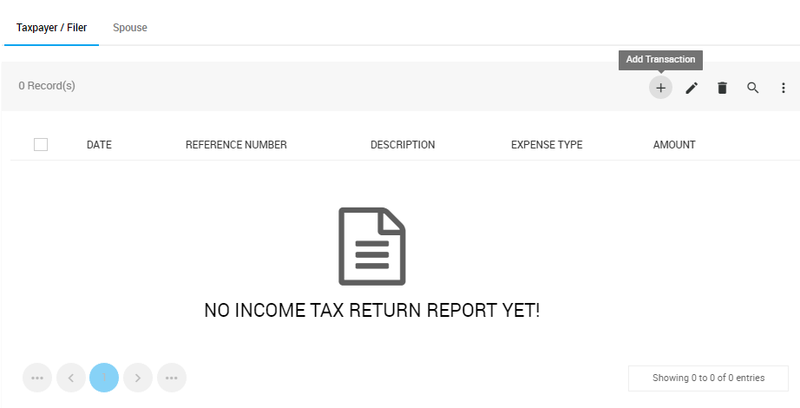 The Input Summary page contains all the exact information which is included in an actual quarterly income tax form, which is why you need to go through all of the sections to successfully file your return. Note: You need to fill out the Background Information section in order for you to proceed with other sections of the form. Once you’re already in the Background Information section , you’ll encounter tabs such as Date of Birth, Filer Type, Alphanumeric Tax Code, Method of Deduction, and Other Information. Enter your date of birth, as included within line 11 of your 1701Q form. You need to choose the appropriate file type between the following radio buttons: (1) Single Proprietor, (2) Professional, (3) Estate and (4) Trust. 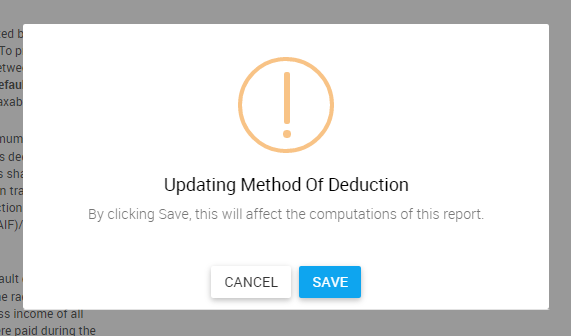 Click Save button to continue. 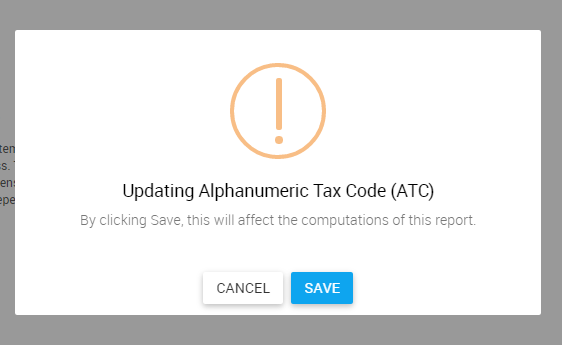 You need to choose the appropriate alphanumeric tax code (ATC) within 3 radio buttons: (1) Business Income, (2) Income from Profession and (3) Mixed Income. 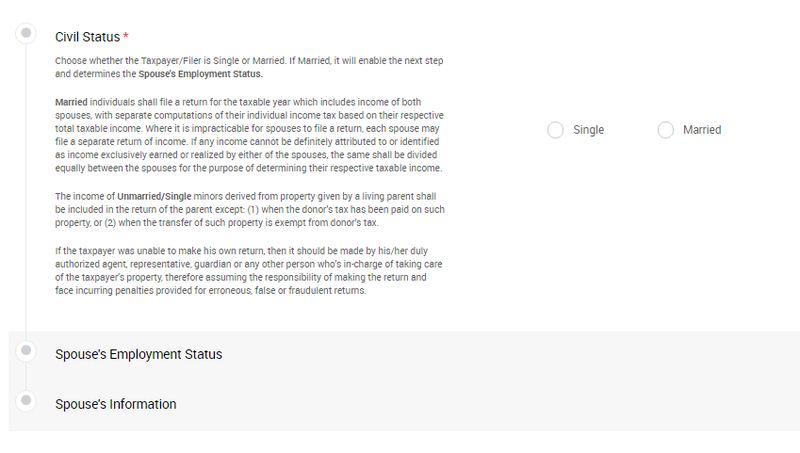 You also need to confirm your civil status by choosing between two radio buttons: (1) Single or (2) Married. If married, you also need to populate sections such as Spouse’s Employment Status as well as Spouse’s Information. After choosing your status, hit the Save button. For your Spouse’s Employment Status, please confirm if your spouse is either (1) Employed or (2) Unemployed. Click Save button to continue. Finish populating the form by clicking the Save Spouse’s Information button. 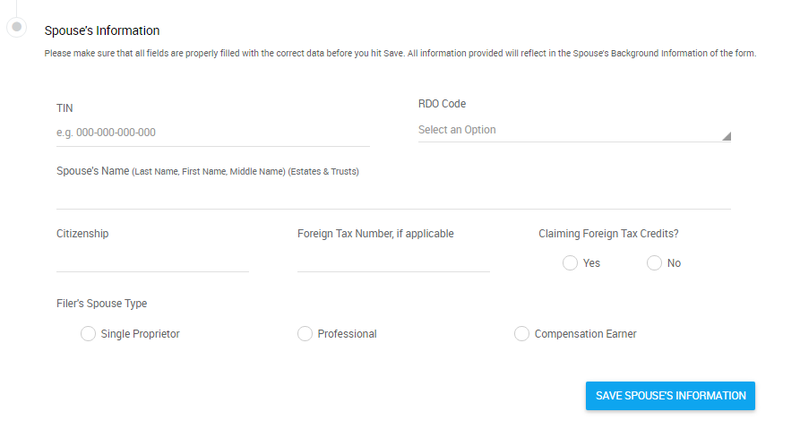 You also need to indicate fill out fields such as Citizenship, as well as Foreign Tax Number. You also need to confirm if you'll be claiming foreign tax credits. After finishing Background Information, all the other sections of the form will now be available for you to access. Go back to the input summary page by clicking the Back to Input Summary button. In this section, you need to enter the transactions (e.g. Sales, Revenues, etc.) which are needed for your quarterly income tax return. Click the Add Transaction button to continue. Note: Aside from adding the report, there are also options for you to edit, remove, search and refine search per page. Populate fields with the appropriate information such as Date, Reference Number, Description and Amount before hitting the Save Changes button. You can always add another line for transactions by clicking the +Add Line button. This includes income of the Taxpayer/Filer which comes from anything other than its ordinary operations, as mentioned in lines 43A and 43B of 1701Q form. This will be added to Gross Income from Operation in order to get the Total Gross Income for this quarter (line 32A and 32B). Click the Add Transaction button to continue. Populate fields with the appropriate information such as Date, Reference Number, Description, Expense Type and Amount before hitting the Save Changes button. You can always add another line for transactions by clicking the +Add Transaction button. In this section, you also need to enter transactions, especially those received amounts from any forms of general professional partnerships. Much like the first section, you need to click the Add Transaction button (plus icon) to start adding amounts. Populate fields with the appropriate information such as Date, Reference Number, Description and Amount before hitting the Save Changes button. You can always add another line for transactions by clicking the +Add Transaction button. This pertains to Taxpayer/Filer (line 52A) and Spouse (line 52B) of the Income Tax Return form. This includes all amounts received from General Professional Partnership (GPP). GPP are partnerships formed by persons with the sole purpose of exercising common profession. 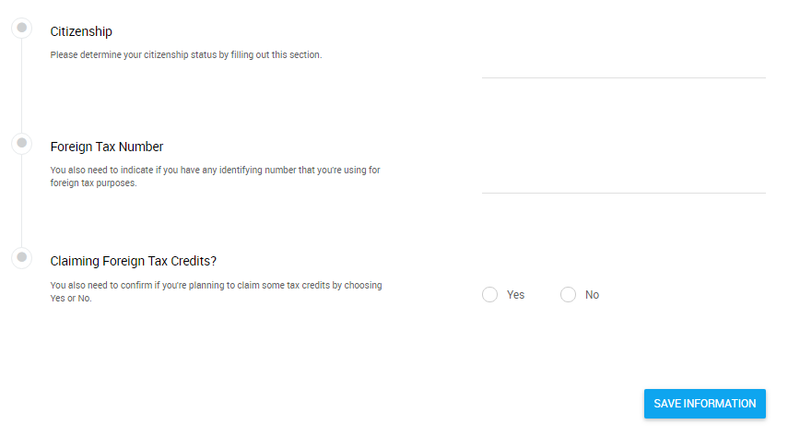 In this section, you need to enter those excess credits which are carried over from the previous year. You need to click on the Add Transaction button (plus icon) to start adding amounts. This section contains a list of all creditable tax withheld transactions for the whole quarter included in your BIR Form 2307, which shows income subjected to expanded withholding tax paid by the taxpayer. Click on the Add Transaction button (plus icon) to start adding amounts. Note: Aside from adding the report, there are also options for you to remove, search and refine search per page. But first, you need to create 2307 transactions for it to appear within this section of the report. Go to Dashboard >Creditable Certificate and proceed to 2307 Certificate tab. You have the option of either creating transactions manually or importing transactions in an instant. If you choose to manually create transactions, then you can either click the Add Transaction button (plus icon), or click the Create Transaction(s) button. 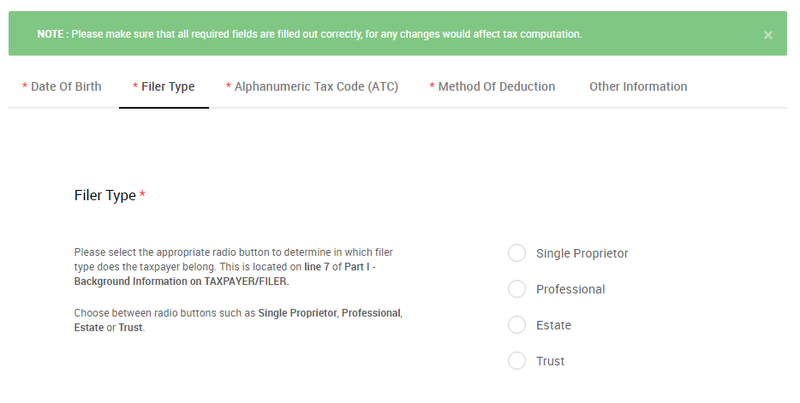 Populate fields such as Customer, Period Covered, Income Payment and ATC before clicking SAVE. After saving your transaction, the record will appear in the creditable tax withheld section of your 1701Q return. Check the box of the transaction then hit Update. After that, your 2307 transaction will appear on the section of the return. You also have the option of adding certificates, delete, search and refine search per pages. This includes income of the Taxpayer/Filer which comes from anything other than its ordinary operations, as mentioned in lines 60A and 60B of 1701Q form. This will be added to Gross Income from Operation in order to get the Total Gross Income for this quarter (line 32A and 32B). This includes income of the Taxpayer/Filer which comes from anything other than its ordinary operations, as mentioned in lines 61A and 61B of 1701Q form. This will be added to Gross Income from Operation in order to get the Total Gross Income for this quarter (line 32A and 32B). Data in this section can be generated manually or automatically. 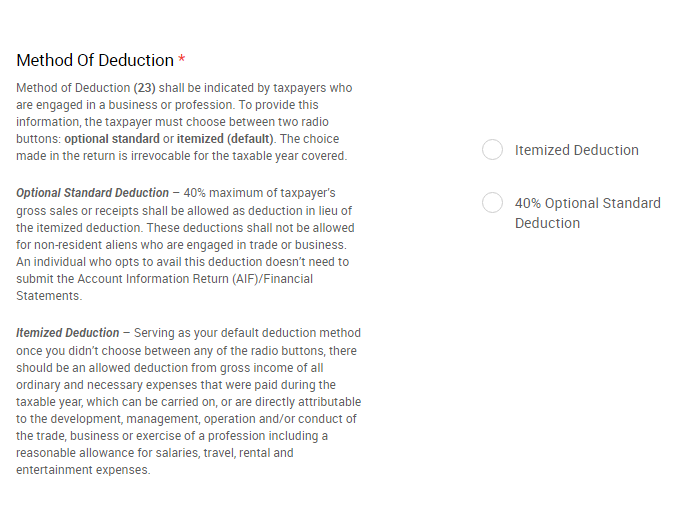 To manually generate data, type the penalties for surcharge, interest, and compromise. On the other hand, click the Compute Penalty button to compute penalties for this report. Click Save Changes button to update your changes. For your authorized representative, you need to populate fields such as: (1)Name, (2)Position of Signatory, (3)TIN, (4)Tax Agent Acc. No. (5) Date of Issuance and (6)Date of Expiry.